Begin by speaking to King Lathas in East Ardougne. Firstly, talk to King Lathas in his palace in the western part of East Ardougne. He will tell you to speak to Koftik. Head to the most western part of West Ardougne and speak to Koftik, who will be your guide. Now enter the nearby cave. Inside, you should now find yourself inside of a big cavern (the Underground Pass) with 3 separate paths; don't take the middle one! Climb the rockslides to the north and you should see Koftik near a campfire. Take a few cloths from him and use them on your arrows, and then use the arrows on the fire (or right click the fire and choose the light option) to get some Fire Arrows. Head north and shoot at the Guide Rope holding the bridge and you should walk across. Do not pull the lever unless you wish to go back to Koftik. Now pick up a plank near the level 60 Blessed Spiders, head south and then east until you find a big hole with an old spike on the ground. Use your rope with it to climb across, and if you fail you'll need to cross the bottom again and restart the pass. Once you cross the obstacle you'll lose your rope. Keep following the path and climb the rocks, and you should come to an area where the Grid Floors are. Everyone's path is different here, but you need to find the correct path to get across safely. If you walk on a bad square, you'll fall through and take damage, and you'll need to climb back up (or you'll keep getting hurt). The path, once found, will always be the same for you, and each square is comprised of 4 mini-squares. You can cross vertically, horizontally, or diagonally. Once you find the correct path, be sure to write it down for later use! To open the Portcullis, pull the lever. You will walk under the raised portcullis, which will close behind you afterwards. Orb 1: Head north and use your Plank on the Flat (and Trap) Rocks on the floor to cross over them, and then pick up the orb. Orb 2: Go northwest, run past the Ogres and Spiders and take the orb. Orb 3: Take the west path and use your Plank on the Flat Rocks to get the Orb. Orb 4:Head southwest and right-click on the orb until you get a "search flat rock" option. You may have to move the mouse around a bit. Do so and you'll notice that it's a trap. If you have a high enough thieving level it will let you grab the Orb. Once you have the 4 Orbs, go back to the Furnace near the grid and use them on it. Now you can go under the well, where you can find crates filled with food! Now go into the first jail cell to the south and use your Spade on the Mud Pile, and then cross the ledge. 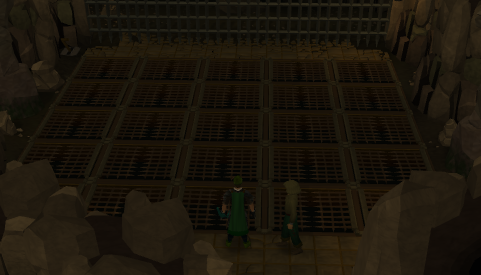 You can either try crossing the bridges here, or you can Picklock the gate if you have 50 Thieving. Cross the pipe after that, and you'll end up at the Unicorn place. Search the cage for a Railing, and then go up, push the boulder onto the Unicorn and take the Unicorn Horn by searching the smashed cage. Proceed into the tunnel entrance afterwards. Follow the passage past the Zombies and speak with Jerro to get some food. Kill all 3 of them to get their Badges. Use your Plank on the Flat Rocks to cross over them, and then search the Well. Put the Badges and Unicorn Horn inside, and the doors can now be opened. Now open the doors and you'll be inside of Iban's cave. Once in Iban's cave, walk west until you reach the northwestern corner. You should see some Cave Stairs there, so walk down them. Speak with each of the Dwarves, one will sell you food for 75gp each, another talks about a witch that know's Iban's secrets, and the other will give you gauntlets later on. Make sure that Niloof speaks about the witch, and then go upstairs and head to the eastern wall. Take the first path that leads to the center and head to the Witch's hut to the south. Don't touch the door! Search the window and it appears that she is looking for her cat. Warning: The ledges can be failed, and if you fail you will fall and take damage! Take the west path and then head north to find her kitten. Pick it up and go back to the Witch's house, and then use it on the door to enter. Now search the chest and you should find Iban's Doll and a History of Iban Book. Read the book and you'll now need to find some items of Iban. Go west of the Witch's house where you'll find 3 Demon Guardians: Holthion, Doomion, and Othanian. They need to be killed. If you have your Bow and Arrows you can handle them, or you can also use Protect From Melee and melee attack them. Note: You can actually mage, range or hally the Demons. You can stand on the thin path as in the picture to the right. Once they're dead, take their pendants and open the chest near Doomion to get the Shadow of Iban. Use the Shadow on the Doll. Go back to the Dwarves and get a bucket from the spawn location. Use it on the barrel in the small shack for some Dwarf Ale. Don't attempt to open the Tomb or you'll take damage! 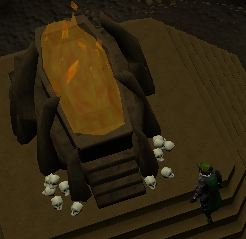 Head east and use the ale on the tomb and burn it using your Tinderbox to get Iban's Ashes , which you can use on the Doll. Head northeast from the Dwarves and you should find a large canyon full of spiders! Kill the level 116 Kalrag and the blood will be smeared on the doll. 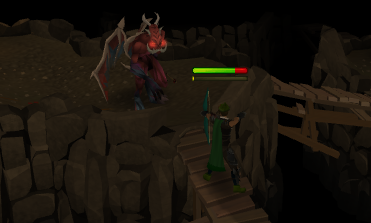 Escape the spiders quickly as they will all attack you immediately after Kalrag dies! Get Klank's Gauntlets from Klank the Dwarf who you spoke to earlier, and then go upstairs. Go completely northwest and search all of the cages of the Half-Souless with the gauntlets on until you find Iban's Dove. Use it on the Doll and get ready to defeat Iban! 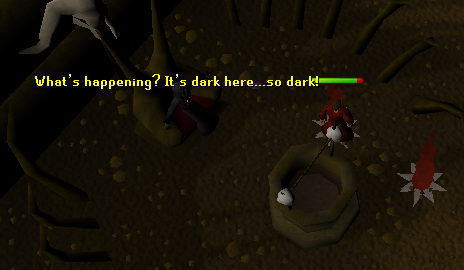 Find your way to the center of the cave and kill an Iban Disciple or two in order to get their Robes of Zamorak. Put the robes on. Now, only wear the robes and don't have any other weapons or armor equipped! Enter the Temple and quickly run to the well and throw the Doll into it. Beware of the spikes coming out of the floor! They knock you back, so you must time it so that you run as soon as they stop coming. 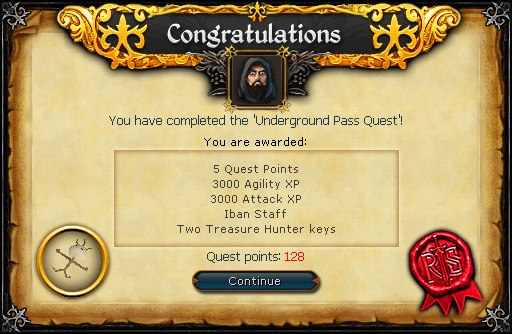 Iban will now die, and you'll get his Staff of Iban, and some Fire and Death Runes! Make sure you have three open spaces in your inventory to receive the staff and runes, as you will be immediately teleported out once the doll is thrown down the well. Speak with Koftik and then report to King Lathas to tell him that Iban has been defeated. Quest Complete! The Staff of Iban allows you to cast the spell Iban Blast. After it runs out of uses, it needs to be recharged at the well near the Paladins. If you lost it, kill an Iban Disciple (The men in red) until they drop a Broken Staff. Take this to the Dark Mage in West Ardougne to have it fixed for 200,000gp.